There were days when Andie was in the NICU that I truly believed things couldn’t possibly get any worse. And then the surgery, the scare, the moment would ultimately pass. Andie would somehow have weathered another storm. But the residue of those traumas would linger right under the surface of my skin, continuing to swirl like grey storm clouds, reminding me not to get too comfortable, for lightening could strike again at any moment. When the power went out in New York City during Hurricane Sandy and the back up generators at NYU’s Langone Medical Center failed, the parents of those teeny, tiny babies being kept alive by machines, tubes and wires, found out that things can actually go far beyond worse. I tried to imagine myself as one of the parents of those evacuated babies. I imagined I’d never recover from such an ordeal, and wondered how the parents of those critical newborns would survive a scare of that magnitude. And then I thought of my friend Yamile, and I knew that it was possible not only to recover, but to find inspiration in a traumatic event. I met Yamile at the National Association of Neonatal Therapist Conference in Texas. I saw her again at the Preemie Parent Alliance Conference in Chicago. I was at the airport on my way home, having just made it through the security line, when I saw her friendly face emerged from the other line. It turned out both of us had an extra hour to spare before boarding our flights. We found a small table at one of the crowded restaurants and sat across from each other. “We’ve now met at two conferences and I don’t even know your story,” I told her. And that’s when I learned about Baby Zack, her baby born eleven years ago, around the same pound and a half size as Andie. Zack was in the NICU when a storm descended upon Houston, Texas, leaving the city without power and her baby’s hospital without power, when the backup generators failed. And from seven in the morning until he was transferred in the afternoon, Yamile kept Zack warm on her chest while her husband manually pumped air into his tiny baby’s tiny lungs. While Zachary lived in the NICU, Yamile hardly left his side. Each night it broke her heart when she had to leave him alone in his isolet. “It was spring,” she said, “and the stores had racks of gardening gloves displayed. 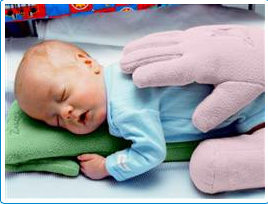 I looked at those gloves and saw hands.” So she took a pair home, slept with one around her neck so it would be full of her scent, and placed it on Zack every time she had to leave him behind in the NICU. Soon after Zack was discharged, the hospital called asking Yamile if she would ever makes her “hands” for the other babies. And with that, she began to fulfill her promise to her son. You can hear Yamile’s incredible story for yourself on this recent Today Show Interview. When Yamile pulled a soft pink fleece “hand” out of her bag and handed it to me, I held it to my cheek. If only I had this way back when I thought. Sitting on the plane, I reflected upon my “chance” meeting with Yamile. I’d called home right before take-off, only to find a very weepy Andie who didn’t want to go to bed until her Mommy was home. The story of my new friend, and the gift I was carrying home for her, served to soothe her tears and coax her into bed. I wrapped the Zaky around my neck throughout the plane ride home, and just as promised, placed it over Andie’s sleeping shoulders when I arrived that night. Every night since, she asks me to put her Zaky over her shoulders. “Do it in a special way,” she tells me, and then snuggles in, safe and held throughout the night. So now when I try to imagine how the parents of those babies in the storm will recover from such trauma, I think of Yamile and hope her rainbow after the storm will serve as inspiration. 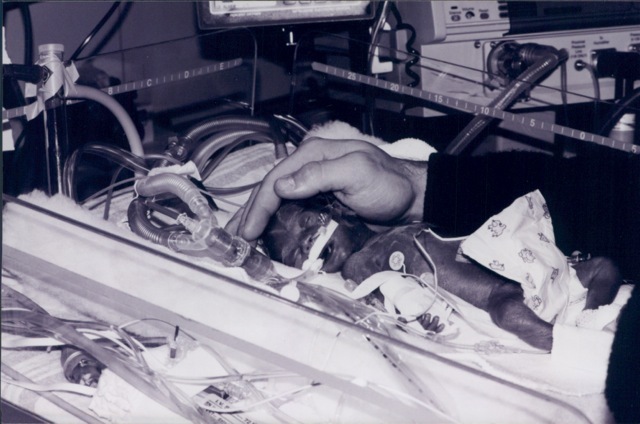 Tomorrow is World Prematurity Day. May it be a day that not only raises awareness about this global epidemic, but a day that brings peace, healing and hope to all those who have been affected by premature birth.